Last Saturday marked the 74th anniversary of Sir Frederick G. Banting’s death. Banting was working for the Canadian military during the Second World War as a biological and chemical warfare researcher for the National Research Council of Canada. He had wanted to return to active service in his unit from the First World War, but he was considered too valuable a researcher to be put into combat. He was also in his late forties when the war broke out and would not have been as physically fit as he had been in his twenties. He was allowed to enlist, but was to continue his research instead of going into active service. Banting died on February 21st, 1941 as he was flying from Gander, Newfoundland to Great Britain to discuss transporting British military research to Canada for safe keeping in case Britain fell to the Germans. There were four men on board the plane that left Newfoundland including Banting and the pilot, Captain Mackey. Shortly after the plane departed, one of the engines failed as they were heading out over the Atlantic Ocean which forced Captain Mackey to shut it down and turn the plane around in an attempt to make it safely back to land. 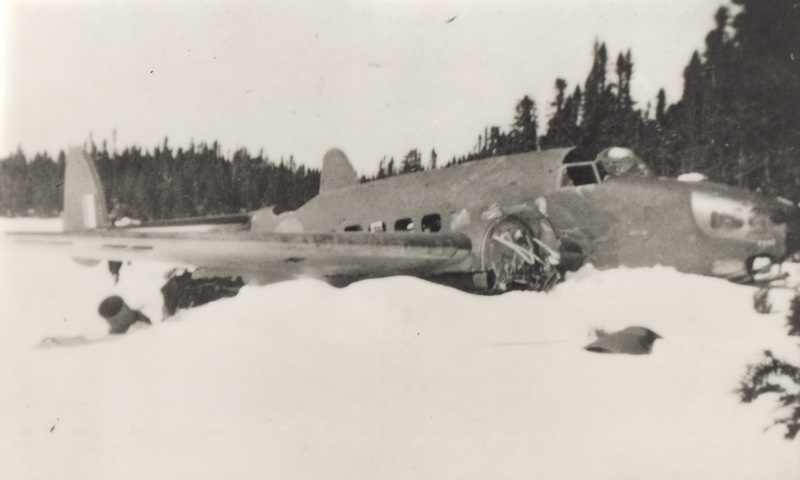 The plane’s second engine failed as they were flying over Newfoundland and Mackey attempted to bring the plane down on Seven Mile Pond (now known as Banting Lake), but the wings clipped the trees and brought the plane crashing down. Banting House NHSC has a piece of the plane on display in the Canadian Hero Gallery along with pictures of the site where they crashed. Before the plane went down, Mackey had told Banting and the other crew members to jump to try to save themselves, but they did not. This may be because they could not see through the darkness where the trees were or were unsure of how high up they were. Banting was also 49 years old at this time, and so jumping out of a plane probably did not seem like an attractive option to him. The radioman and navigator were killed instantly. Banting and Mackey survived the crash, but Banting was badly wounded and disoriented. Mackey went looking for help, and during the time he was away Banting wandered outside the plane and died of exposure. Three days after the crash, rescuers found the plane and Mackey, who shared what had happened. It is a testament to his character that one of the last things he did was to help bandage the wounds that Mackey had received. The Hudson Bomber Flight T-9449 plane that crashed on Seven Mile Pond in Newfoundland. I was asked last week during a tour what I thought the lasting legacy of Dr. Banting should be, whether it is his contributions to medicine or his personal character. Both are very important in remembering Banting, as his disposition influenced how he went about conducting his research and ensuring that insulin would be accessible for people with diabetes. While Banting is best known for his work with insulin and helping millions of people with diabetes lead better lives, his contributions to Canada also included his military research and his ultimate sacrifice as he was doing what he saw as his duty by participating in the war effort. Posted in Uncategorized.Tagged Banting House, Captain Mackey, Frederick G. Banting, Newfoundland, Second World War, Sir Frederick Banting, the National Research Council of Canada. .My father who was stationed in Newfoundland during the war with the Lincs Regiment ,told a story to me when I was young,that after the crash he hiked to the site and salvaged a chunk of fuel Line from the wreck and made a ring from the line,he showed it to me then and I never seen it again untill 2 years ago when I found it in his war collection. Previous Post Banting House NHSC Wins the Architectural Conservancy of Ontario and Heritage London Foundation’s Built Heritage Award!